Four hundred undergraduate science students from across the Institutes of Technology presented their undergraduate research projects at three simultaneous conferences hosted by Dublin Institute of Technology, Athlone IT and Waterford IT on Friday, 28 September. The South Eastern event took place in the WIT Arena and was attended by close to 150 graduates, current students and staff from Cork IT, Carlow IT and WIT and industry. According to the Co-Chair of the SURE organising committee at WIT, Dr. Claire Lennon, “the 8 oral presentations and 13 poster presentations showcased the very best of undergraduate science research in a broad range of topics, including an evaluation of probiotics as an alternative to antibiotics in commercially reared pigs, the recovery of phosphorus from disposable nappies, and a chemical comparison of different brands of sunscreens to establish their UV filtering abilities”. Co-Chair Aubrey Storey said “The inaugural SURE conference was a fantastic event that was thoroughly enjoyed by all who participated. It will serve as great platform upon which research and learning in the sciences can be developed in WIT and across the Institutes of Technology sector”. Speaking at the opening of the event, Dr. Peter McLoughlin, Head of the School of Science at WIT said, “We are delighted to be hosting the southern section of the inaugural SURE Conference in WIT. This event is providing a fantastic opportunity for undergraduate students to present their research to a large and varied audience”. Speaking from the conference to local radio station, WLR FM, Mark Armitage, a recent Agricultural Science graduate from WIT, had this to say about his research: “I conducted a genetic study of my own dairy herd at home in North Tipperary. I found that different genetic types influenced economically important production traits. What was interesting about the research is that I can put the results into practice on the farm to inform our breeding decisions over the coming years”. On congratulating of the students who presented their research at the event, Dr. Orla O’Donovan, Head of Department of Science at WIT said “the standard and variety of the presentations and posters presented here today were of a standard that I would expect to see at any national or international conference”. A judging panel selected the best oral and poster presentations on the day. The award of “Best Presentation sponsored by the PMBRC at WIT went to Jessica Murphy from WIT. Jessica’s project, supervised by Dr. Sweta Rani investigated mechanisms by which an aggressive form of breast cancer (HER2-positive) spreads to other parts of the body. The work identified several genes and regulatory pathways that could in the future be targeted for novel gene therapies. The judging panel award of “Best Poster”, sponsored by MSD went to Lucas Bwema Vandi from WIT. Lucas studied thiocarbonyl compounds and how they can by synthesised for pharmacological purposes. Lucas’s project was supervised by Dr. Joe Power. The audience also had their voice heard. Using an online app, the audience unanimously selected Siobhán O’Neill’s presentation supervised by Dr. Eva Norris at Cork IT. Siobhán compared different methods for the accurate detection of solar irradiance and discussed how the data can be used to model surface temperatures to monitor the effects of climate change. The prize was sponsored by EirGen Pharma. The audience selected a poster by Leonat Xhokli of WIT. His project was supervised by Dr. Graece Shiau Pin Tan and examined antimicrobial and antioxidant compounds found in seaweed. The prize was sponsored by BioSciences. Throughout the day, the audience was inspired by several guest speakers including Tom Brennan, the co-founder of EirGen Pharma; Dr. Mícheál Ó Foghlú, Engineering Director of Google Munich and Co-founder of TSSG and FeedHenry; Sinead Quealy, Co-founder and Managing Director of VirtualVet; Dr. Peter McGuigan, Chemist and Analytical Developer at MSD, and Dr. Mark White, Vice President of Research at WIT. 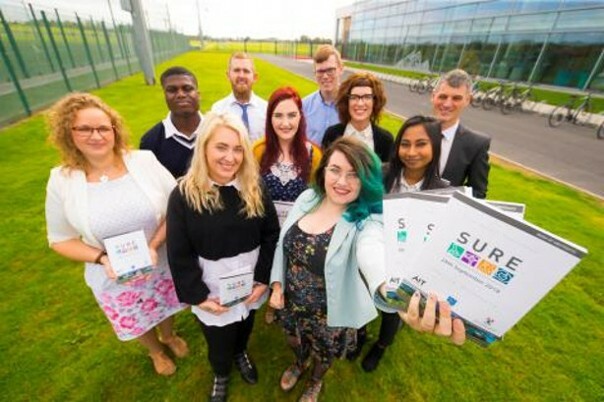 Next year’s SURE conference is due to take place in IT Carlow, where a cohort of undergraduate students currently undertaking research for their 3rd and 4th year projects across the three institutes will be selected to present their research at the event.